The RECLUSE is approximately 19 feet long and 20-1/2 inches maximum beam. It has excellent hull speed, and its narrow beam facilitates control in steep waves and chop that tend to pitch wider kayaks. The low rear deck profile minimizes windage and allows easy layback for Greenland style bracing and rolling. 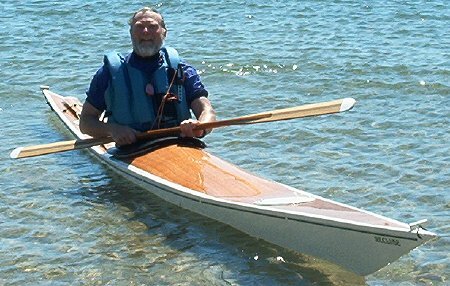 The RECLUSE is designed for the medium to heavy weight paddler, although lighter paddlers may choose this model when carrying moderate gearloads or paddling in mild conditions. Weight: 30 to 34 lbs. Recluse (ree-kloos) — Appropriate for a kayak alone out in front of the pack. The Hermit Boatbuilders favorite, designed with the independant solo coastal tripper in mind.